This fairly new restaurant in the center of the Magnificent Mile focuses on Italian bar foods/street foods. They have an authentic brick oven for making various pizzas and other classics. They also offer traditional hot appetizers and some cold cuts/cheese flights. The atmosphere is amazing. You feel like you are sitting in the middle of an Italian village. They staff is very knowledgeable about the items on the menu and are willing to offer their opinions on which pizzas to choose. Unfortunately, I was very disappointed with the food... it was either too simple or not Italian enough for me. However, I was able to eat one of the best appetizers I have had in a while, and for that reason, I gave them an average rating with hope of returning and having a better experience. I still recommend this restaurant to friends and they all enjoy it so definitely try it out... just don't order the two pizzas I did. Finally a restaurant in the city that makes a delicious arancini. These are one of my all time favorite appetizers to order and Bar Toma does a really good job nearly perfecting this Italian classic. This one is made with Acquerello Rice, fresh prosciutto, and peas. These ingredients are rolled into a ball, lightly covered with fine bread crumbs, and quickly deep fried. I was extremely surprised to find an arancini that was creamy and moist without having additional cheese or a sauce added inside the rice ball. It was topped with shaved parmesan cheese which was unreal! The order comes with 5 smaller arancini or sometimes 3 larger ones. Regardless they are delicious and a must order if you decide to come to Bar Toma. 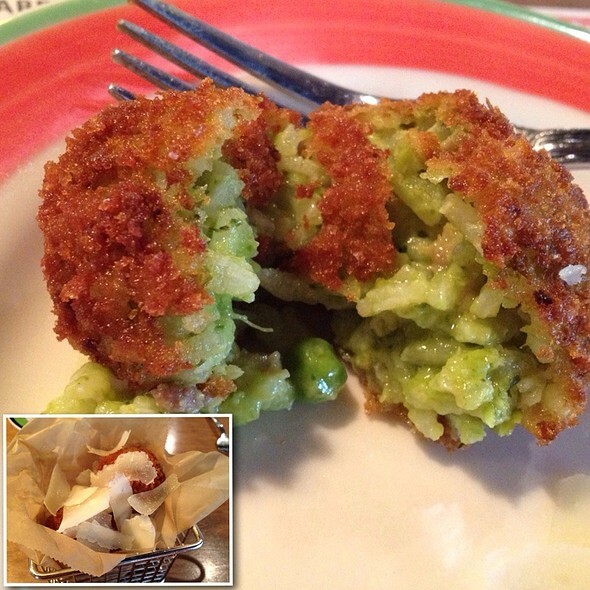 After eating the delicious arancini, I was looking forward to the rest of the meal. However, I was immediately disappointed when we received the Spaniard Pizza. When ordering, I assumed the chorizo would be sausage style (like I had the previous night at another Italian restaurant). Instead, the chorizo was Mexican Chorizo. 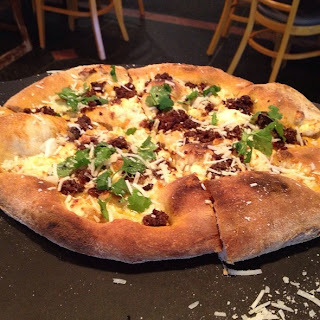 The pizza was sprinkled with fresh cilantro and their house cheese. This pizza was just oily and tasted like a taco. There was almost no Italian spin to it except for the brick over crust which was burnt in some places and undercooked in others. Please do not order this pizza because it is simply not special and not very pleasing to eat. With the pizza being a disappointment, I was hoping this house specialty appetizer would make up for it. 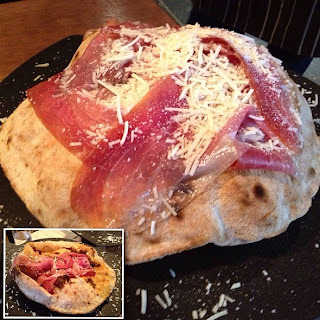 The Milano Bomba is very unique... specifically, it is their homemade dough cooked in a way that poofs up into an air packet and then topped with freshly sliced prosciutto and cheese. It arrives blown up and then is popped at table side. This dish was unique but it was very one-note in terms of flavor. All you could taste is the prosciutto. The "crust" was not seasoned at all... and some areas were burnt and others were not. Luckily, the crust was also cardboard flavored so maybe the prosciutto was thankfully the only flavor I could taste. Anyway, I wouldn't order this unless you want sometime extremely plain. - Do order the Arancini. It is delicious and an appetizer that should not be missed. This is probably one of the closest arancinis to what I would eat when I lived in Italy. - I have heard good reviews about their gelato but I haven't tried it yet. So let me know if anyone has! - Once the weather is nice, a small patio is available for outdoor dining. Sometimes they will open their large windows to allow the nice weather into the restaurant. - Don't be too creative with your pizza orders. I suggested this restaurant to some friends with the disclaimer that I wasn't the biggest fan. I also suggested they ordered a plain pizza... the Margherita to be exact... and they loved it.